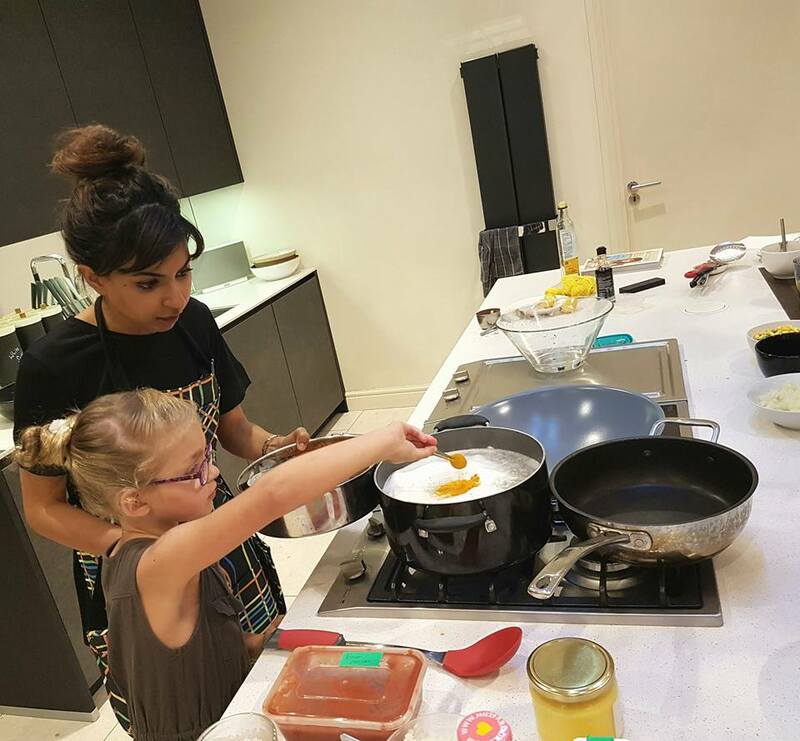 An exclusive dadima’s cookery workshop for children aged between 5 to 9 years old. To make a booking, please use the drop-down menu to select a date and adjust the quantity of tickets according to one child or two children. Before checking out, we ask that you take a few moments to read the workshop information and terms & conditions (scroll down this page) . You will be asked to complete a pre-attendance form for your child. This is vital for our planning and communication with you as a parent. 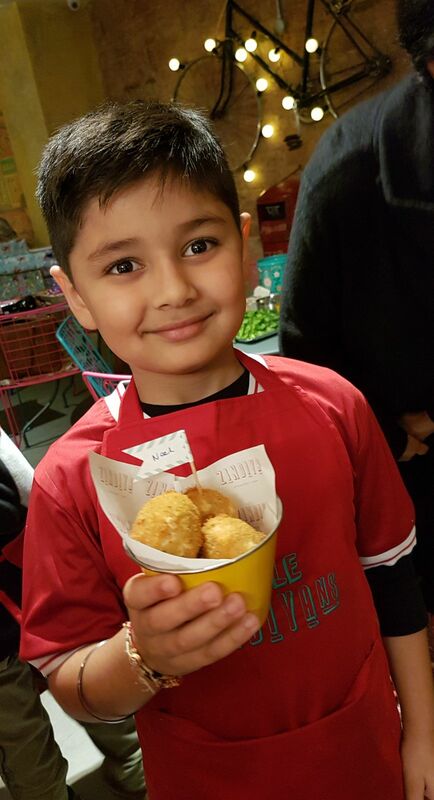 If you are booking more than one child, please e-mail us on anneeka@dadimas.co.uk after booking and we will send you a blank form to complete. We are old-school in our communication and can arrange a friendly phone chat if you have any questions. 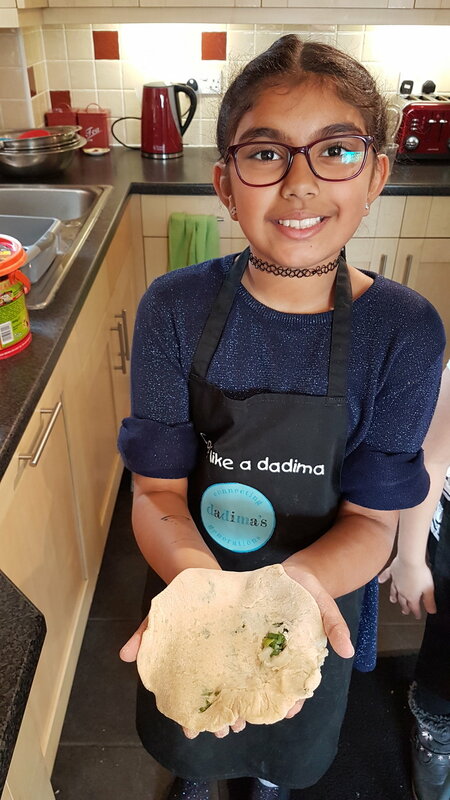 What is ‘cook like a dadima’ for little chefs about? 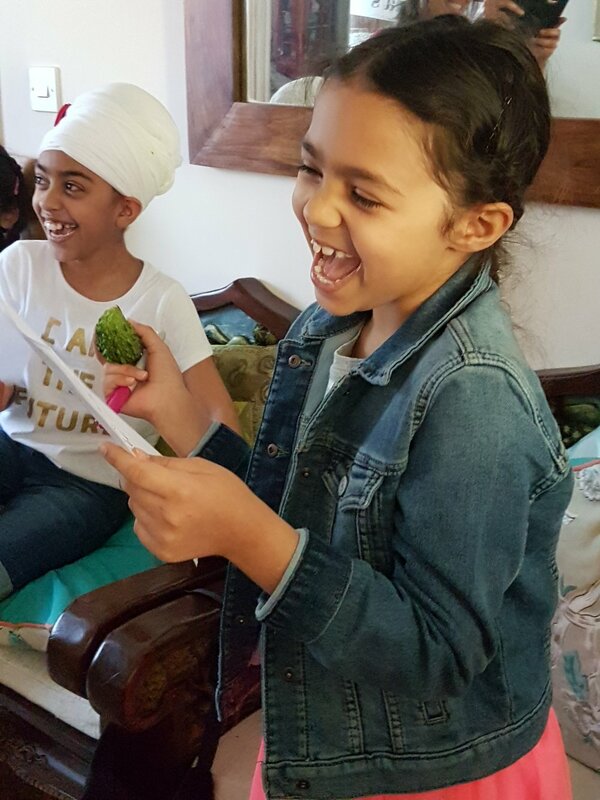 Dadima’s exclusive cookery workshops are conducted in small groups to engage children with hands-on cooking activities in a safe, clean and nurturing environment. Our workshops are held in the Heathrow/Windsor area (address provided upon booking) and our kitchen has been given a 5-star food hygiene rating by the local authorities. What do I need to do as a parent? Our workshop is typically around 6 hours from 09:00am until 15:00pm-ish (unless otherwise stated in the booking e-mail). On Sunday 2nd June the workshop start time is 10:00am with a 16:00pm-ish finish time. Dadima’s is a family brand. Anni (founder of dadima’s & author of dadima’s cookbook) and Dr Geeta Ludhra (PhD in Education) - Anni’s mother, a talented foodie and writer, run the workshops. We do not outsource our teaching and are both DBS checked. Anni has had a lifelong passion for heritage cooking, inspired by her grandmothers. Through her cookbook research, where she interviewed dadimas across the UK, she has a wealth of culinary skills to share. 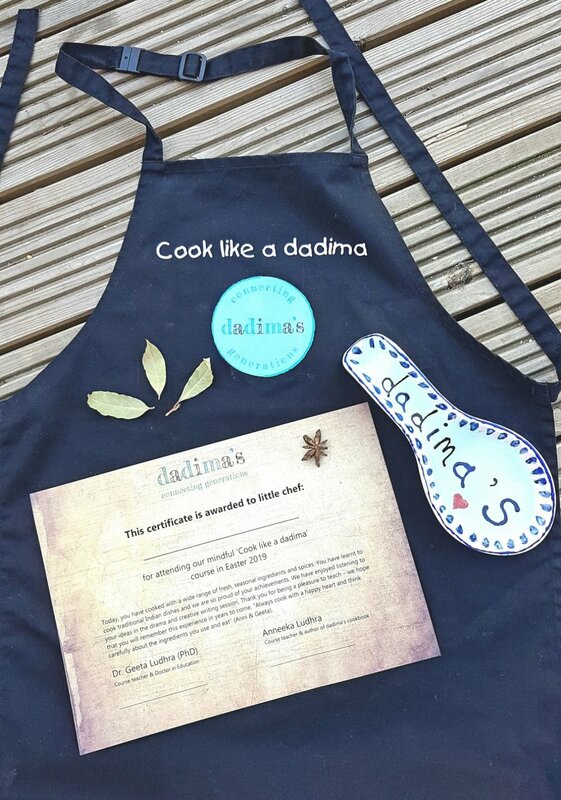 Anni runs cookery events across the UK, inspired by the grandmothers who have been part of dadima’s journey. She has spoken regularly on BBC radio, sharing heritage food stories, rooted in grandparents' wisdom. To read more about Anni and why she created dadima’s brand, click here. Dr Geeta Ludhra (PhD) has extensive experience of teaching across primary and secondary schools - specialising in English language, creative writing and drama education. Geeta works as a governor in two primary schools. Geeta has worked in university education for over 13 years. She is a passionate vegetarian foodie, who has been cooking from a young age, taught by her parents and mother-in-law. She supports dadima’s food, educational events, and marketing. Her favourite Indian foods are saag, paneer dishes and aloo gobi. 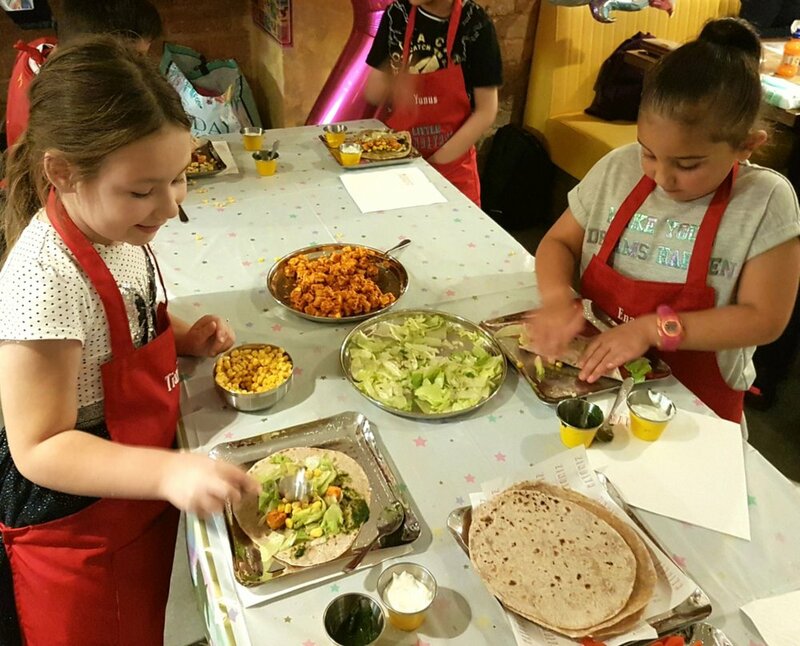 What’s the story behind our ‘Cook like a dadima’ workshops? 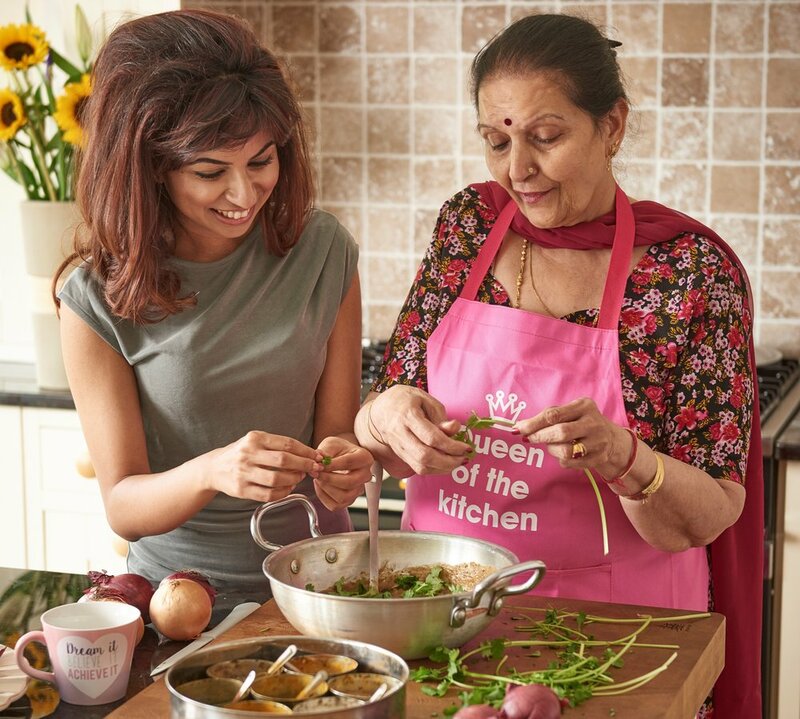 Anni was inspired to ‘Cook like a dadima’ through her cookbook research and upbringing in the extended family. She is passionate to share her culinary knowledge with younger generations, as this is how their legacies and culinary wisdom will live on. Our workshops are underpinned by a mindful cooking approach - a style that dadimas usually practice when cooking. This is why mindfulness sits at the heart of our brand and workshops. What do we mean by ‘mindful cooking’ at dadima’s? 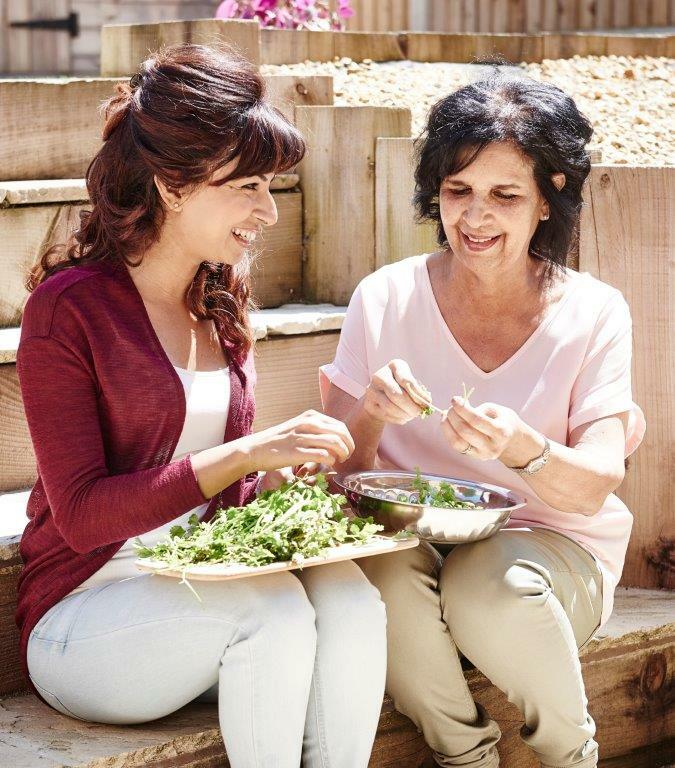 We are inspired by the way a loving dadima (or dadaji) would teach her family to cook – through a nurturing, relaxed approach and with her children’s nourishment in mind. A loving dadima takes time to source quality ingredients, prepare food ‘in the present moment’, and cook drawing on all the senses. At dadima’s, we celebrate cooking as a creative process to unwind and escape the ‘busyness’ and stresses of everyday life. What’s our style of teaching? 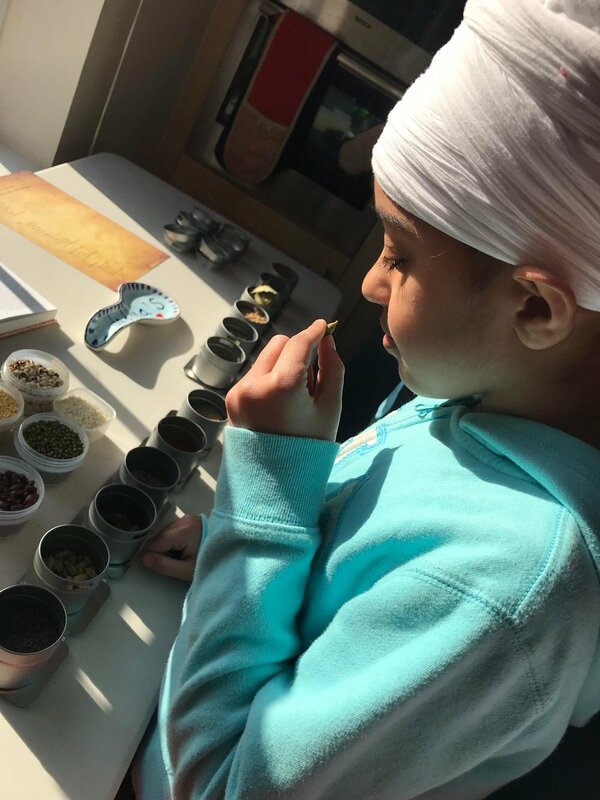 Our style of teaching is embedded in dadima's brand values of learning through doing, creative exploration of ingredients, and instilling a life-long passion for cooking heartwarming and healthy dishes. The day will be fun, relaxed and interactive. We will be teaching through a combination of cookery demonstrations and mostly hands-on learning. Throughout the day, we will create a respectful where children will be encouraged to ask questions and develop their own ideas. Our menu uses responsibly sourced, fresh ingredients and consists of heritage Indian dishes, with a modern twist and using seasonal produce where possible. We do not cook with meat, fish or nuts. We adapt our menu according to the children’s dietary requirements/ allergies. We teach one main dish accompanied by side dishes and a dessert. What’s included in a ‘cook like a dadima’ workshop? 45 minutes of drama/ writing activities based on the workshop content. A workshop that responds to your child's prior cooking experiences. Basic introduction to food hygiene and safety. Food appreciation and gratitude through mindfulness activities. A respectful environment which promotes collaborative team work. All equipment, ingredients and aprons provided for use during class. Workshop certificate for your child . Most importantly, it will be a day of enjoyment and fun, with global music to spice up the day!